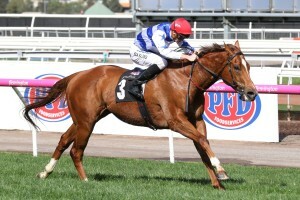 A wide barrier for multiple Group 1 winner Redkirk Warrior in the Group 1 $500,000 Ladbrokes C.F. Orr Stakes (1400m) at Caulfield on Saturday doesn’t concern Lindsay Park co-trainer Tom Dabernig. A wide barrier will suit Redkirk Warrior, above, in the 2019 C.F. Orr Stakes at Caulfield. Photo by Ultimate Racing Photos. Dabernig trains in partnership with the father and son team of David and Ben Hayes and can see a wide barrier draw giving the big striding Redkirk Warrior plenty of galloping room. “I don’t mind that barrier draw,” Dabernig said. Redkirk Warrior has drawn barrier ten in the C.F. Orr Stakes field that has been reduced to fifteen runners following the early withdrawal of Fell Swoop. Redkirk Warrior was the sprinting king down the Flemington straight over the last two Melbourne Autumn Carnivals with back to back wins in the Group 1 $1.25m Lexus Newmarket Handicap (1200m) as well as a win in the 2018 Group 1 $750,000 Black Caviar Lightning (1000m). The Lindsay Park Team have changed direction with Redkirk Warrior and are keen to step him up in distance during the 2019 Autumn Carnival and Dabernig said that the giant chestnut was ready to tackle the 1400m of the C.F. Orr Stakes after a first up fifth to Whispering Brook in the Group 2 $200,000 Australia Stakes (1200m) at The Valley on January 25. “I thought his first up run was excellent and I think the 1400m will suit him,” Dabernig said. Redkirk Warrior is the most fancied of the three Lindsay Park C.F. Orr Stakes runners at $10 at Ladbrokes.com.au with Fifty Stars marked at $18 while So Si Bon is the $126 outsider. New stable acquisition Fifty Stars has drawn barrier nine with apprentice Ben Allen to ride while Luke Nolen’s mount So Si Bon will jump from gate fourteen if there are no more scratchings.